AccorHotels has just announced the opening of the Mercure Bangkok Sukhumvit 11 which is located on Soi 11 of Sukhumvit. Known for the numerous restaurants, bar and clubs which are prominent in the evenings, Sukhumvit Soi 11 has long been a magnet for tourists, expats and locals who are attracted to the night life. The property is also within walking distance to not only the BTS Skytrain Nana Station and MRT Subway Asoke Station but also the Airport Link Makkasan Station. Click HERE to check out the room rates of Mercure Bangkok Sukhumvit 11! Rooted to its community, Mercure Bangkok Sukhumvit 11 offers a choice of 232 spacious and comfortable rooms and suites with authentic Thai-style décor and furnishings. Its signature Thai silk décor is seen throughout the property from the lobby, guest rooms to the public areas. The 34sqm Deluxe Rooms feature a 43-inch widescreen TV, coffee/tea making facilities and mini bar while the 43sqm Privilege Rooms features an espresso machine, a Bluetooth smart T.V. and the Suites on the uppermost floors offers a separate living room that can accommodate families on long and short term stays. Guests staying in the Privilege Rooms and Suites also have exclusive access to the Privilege Club on the 16th floor, where a choice of complimentary snacks and beverages are available daily. For those who wish to dine in, El Gaucho Argentinian Steakhouse offers a selection of freshest locally sourced and sustainable produce while Alex Brasserie, the hotel’s all-day-dining restaurant, serves daily buffet and à la carte menu options featuring live DJ music into the late hours. For the sun lovers, the Pool Bar is the perfect place to chill over a refreshing drink and snack. 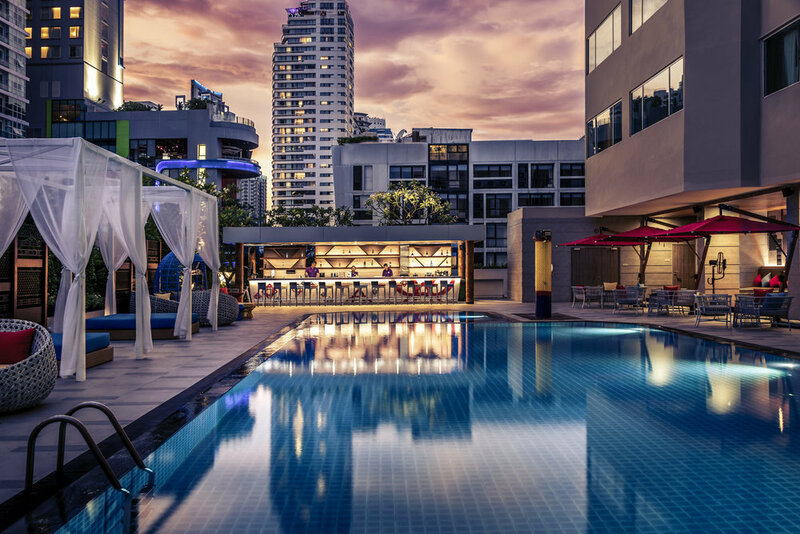 For an evening work out, the Fitness Centre is equipped with state-of-the-art gym equipment while the rooftop swimming pool offers a breath-taking view that overlooks Bangkok’s iconic skyline. Guest can also enjoy a pampering spa treatment at the award-winning Le SPA with L’Occitane, located just a few steps away at the sister property Sofitel Bangkok Sukhumvit. Celebrate the opening ofMercure Bangkok Sukhumvit 11 with a deluxe room stay at THB 3,200++ per room night. For reservations, email HA247-RE@accor.com, call +66 (0) 2 120 8888, or for more information, visit http://www.mercure.com/gb/hotel-A247-mercure-bangkok-sukhumvit-11/index.shtml.